Lighting systems and lighting control are an essential part of any agricultural plant, in particular poultry farms. 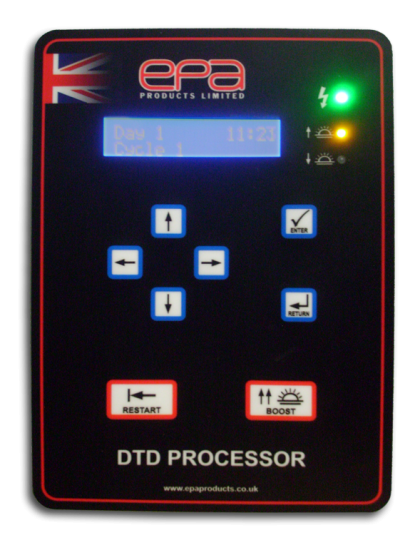 EPA supplies a range of lighting control panels for agricultural use, as well as systems for the control of tungsten fluorescent lighting, LED and dusk and dawn control systems. Many of our systems are customised to suit individual needs, such as water resistance to IP65 from suppliers such as Disano, Littledown & Saxby, and EPA is always willing to discuss requirements to suit. 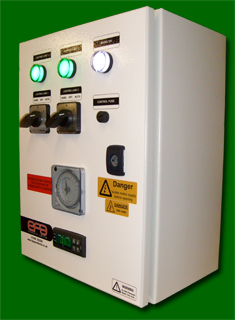 We also hold a wide range of spares including diffusers, chokes, transformers, tubes and tube holders. In particular, large discounts are available on a range of replacement fluorescent tubes. EPA has introduced a digital dusk and dawn dimmer control. 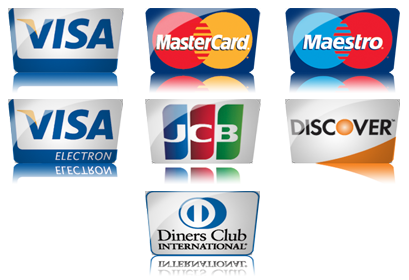 The digital dusk dawn control has been designed to be used with the EPA high frequency energy saving fluorescent lighting and tungsten lighting. 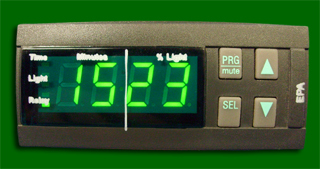 Basic on/off times are still adjusted on a standard 24-hour lighting control clock. The first set of digits is the time span for lighting ramping up and down is adjusted from 0-30 minutes. The second set of digits is the desired brilliance adjusted as a percentage. The units are made from shatterproof polycarbonate. The unique ramp up circuit brings the lights up gradually to its preset intensity with no flashing to frighten the birds. Units are available with or without time switch, and special higher capacity units with the option of individual lane switches can be built to specification. The memory is not lost during a power failure and as an extra saving at 0% lighting after a short period the control circuit opens completely switch the lighting completely off. Ambient Temperature: 0° to 50°C. Storage Temperature: -10° to 70°C. Contact Rating OP1: 8A @ 240v AC resistive. Electrical Life: 200,000 operations at rate load. set a real time lighting pattern. Lighting pattern works in real time with the age of the flock. Independent ramping up time / ramping down time. Simple Mode Setting Switches for single channel or two channel operation and enhanced lighting pattern. Alarm output for lighting control power supply failure. Power Supply 85vac – 250vac 50/60Hz. Input for 12vdc UPS Power Supply. Lighting Control output 0 – 10v signal. 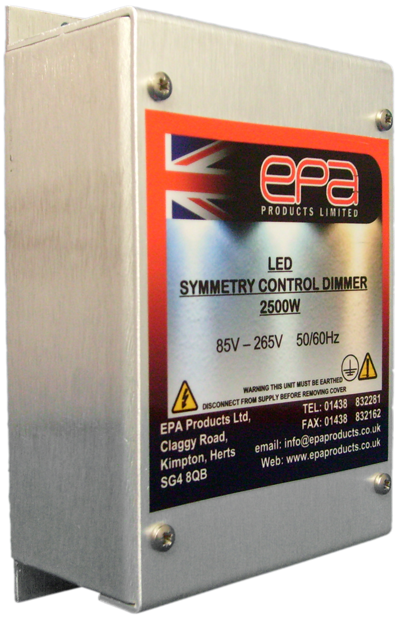 The EPA LED Symmetry control dimmer was designed with micro processor control to eliminate flicker associated with dimmable Led lights. Simple installation can be retro fitted to most lighting systems when up grading to Led lighting. There is no requirement to install lighting filters / chokes or snubbers. Micro Processor control self stabilising to eliminate light flicker. Agricultural – Horticultural – Aquatic – Industrial and Home Automation Lighting Systems. 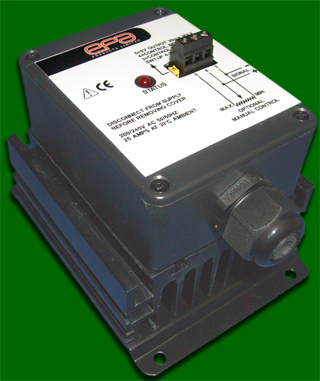 The EPA Dimmer Controller for LED and Low frequency lighting is available for single phase, 230V applications. They can control loads of up to 25A, with a number of signal control options. The controller comes complete with appropriately rated High Speed semiconductor fuses and an integral heatsink. Massive 0.3 C/Watt earthed heatsink. Control Voltage DC: 0v Min ~ 25v Max. 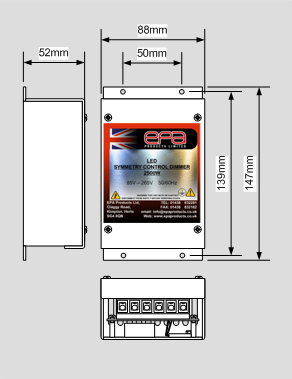 EPA Products Limited is a company registered in England.